A national manhunt is ordered for a rebellious kid and his foster uncle (Sam Neill) who go missing in the wild New Zealand bush. Directed by Taika Waititi, also known for What We Do in the Shadows. Currently #99 on Rotten Tomatoes' list of Top 100 Movies of All Time. This is possibly the only time that this film and Fellini's 8 1/2 will appear in close proximity. Loved this movie, full of great performances. I was particularly tickled by Rachel House's stern, officious foster care supervisor, Paula. "No child left behind, Ricky. No child left behind "
This movie is currently the top box-office performer in New Zealand (bumping Boy (also by Taika) to second place) and is a worthy depiction of the indigenous bush Kiwi, but not necesarily all of us. Let's see what Taika does with Thor. Go see this movie, and come back here for translatios/explanations. My favorite part is when Ricky flips the cover over to reveal the hot water bottle. Such a small touch to reveal how thoughtful Bella is and how Ricky appreciates it. Second favorite part: when Bella kills that wild pig. There is just so much in this film, I am, as Ricky would say, going to need some time to process it. It was funny, but there was a lot of stuff about child welfare, and hardship, and the young actor playing Ricky is so talented for being able to pull off the comic timing mixed with truly sad stuff... and also the blend of wise beyond years vs totally innocent. One thing that sticks with me as a subtle additional critique of child welfare is that Ricky ends up placed with a family where the dad, knowing he was missing/kidnapped took selfie and wished him well, then did not call for help. Less overt than the "housing inspection" but pretty damning. And the selfie scene was hilarious. I loved this film. I wasn't sure what to expect, but it was the right amounts of funny and heartbreaking. The acting was brilliant. I love “best possible realistic happy endings” when well done! They feel much truer than endings where everything work out. So I’m happy to not interrogate the ending too closely lest it fall apart. What a solid movie. In reviews I saw Wes Anderson getting name-dropped, and I can see why - the pig killing was right out of Moonrise Kingdom. No complaints though - homage is just fine. Only saw this a couple of days ago and, yes, wonderful. I don't have anything to add that hasn't come up, but am I the only person who is really reminded of Bill Forsyth at his best? This would make a fantastic double bill with Local Hero or Housekeeping. Just saw this now it's on Netflix, and loved it. It's like If the bits of Jurassic Park where Sam Neill grudgingly looks after kids, Flight Of The Conchords, and Up all had a baby that was even better than the sum of those parts would suggest. Continued a tradition last night - don't watch the Oscars, watch that film you've heard good things about instead. Glad I did. Wonderful movie. Wes Anderson like at times, yes, but I'm ok with that. I absolutely loved the moment when Ricky and Uncle Sam Neill are hiding from the swat team and Ricky points out how much it looked like the scene from Lord of the Rings where the hobbits hide from the Ringwraith because I was thinking the exact same thing. Wes Anderson like at times, yes, but I'm ok with that. Wanted to add a note on this, since I saw Boy after seeing this. While I still think that the Wes Anderson comparison is apt, it’s also clear to me that Waititi’s been doing this kind of stuff for a while on his own as well. Another great one to check out (h/t arzakh) and also on Netflix right now. International viewers may have got the references listed on IMDB, but they may not have recognised the New Zealand specific references and homages liberally sprinkled throughout the film. My favourites are the old Toyota Hilux ads featuring Barry Crump (the author of Wild Pork and Watercress - the book that Wilderpeople is based on). 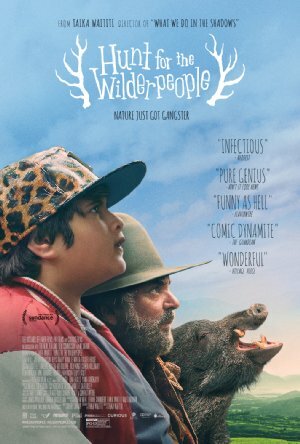 What a fun movie.. Sam Neill and Julian Dennison were so good. Neill especially seemed more lightly gruff than I thought he would be. None of the tragedy really landed for me, except I was not expecting the mother to die. She was a good person but she was also a good character and her sudden removal was very effective. I read that differently; the family is Maori and they would know better than anyone NOT to trust Child Welfare and the police. There was no reason for them not to believe Ricky when he said he was happier with Hector and didn't want to go back with Child Welfare. Remember, Paula placed Ricky with a couple (who ended up being wonderful, but she didn't know that), one half of whom had a criminal record for manslaughter. She didn't do due diligence on that or a proper inspection of the home--she looked at the exterior and was like, "Looks great to me. No returns!" and zoomed away in the cop car.